EERIE at best, terrifying at worst, this 2009 solar eclipse was a monster. Maximum totality – when the sun is completely covered by the moon – in this case lasted a whopping 6.6 minutes, and won't be repeated on such a scale until 2132. Czech photographer Miloslav Druckmüller and his daughter witnessed the spectacle from the Enewetak Radiological Observatory on the Marshall Islands in the North Pacific Ocean, which fell within the narrow path of total darkness cast across the globe. But Druckmüller wasn't there merely as a dad or even as a photographer – although he shot 80 images during totality and made this image from a composite of 30. He was part of the sinister-sounding shadow-tracking expedition. 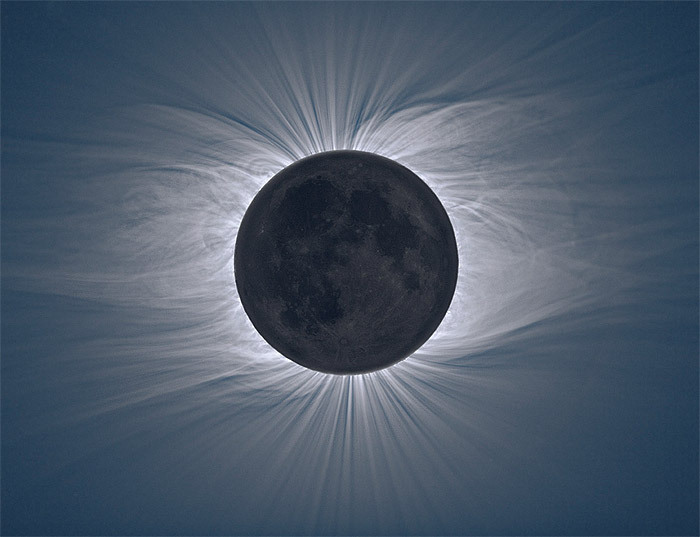 Shadow trackers record solar eclipses from various places to study changes in the sun's upper atmosphere, the corona. One of the big solar mysteries – apart from the brain-scrambling plot of Danny Boyle's film Sunshine – is why the temperature of the sun's corona, at 1 million °C, is 400 times hotter than its surface. Shadow trackers hope to provide an answer.